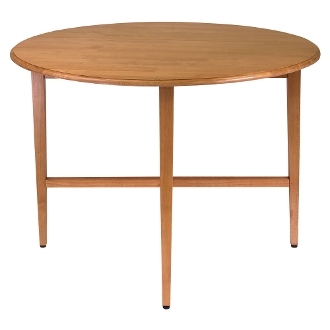 Straightforward and economical, this Winsome Wood 42-inch round drop leaf table doesn't skimp on quality: sturdy solid/composite wood construction and subtle tailoring make it a useful piece for years to come. When guests arrive, the table's two leaves fold out to make room for four with a graceful beveled top edge and slender, tapered legs that provide plenty of support without bulk. With just one leaf up, the table works well in small spaces like studios or kitchen breakfast areas. To store, simply put both leaves down and collapse the crossed support rails. The table's light Oak finish is casual and warm under colorful placemats for everyday use or add a linen tablecloth and china settings for more elegant affairs. It measures 29-1/2 inches high and comes fully assembled. Overall Fully Open table size is 42" Round x 29.50 High. Each Drop Leaf size is 42"W x 17"D.
Table top size with one leaf up is 42"W x 25.75"D. Table Folded is 41.90"W x 9.7"D x 29.30"H.
Made with solid wood in light oak finish. Assembly Required.